mDesign Metal Hand Towel Holder for Bathroom Vanities - Split Finish by mDesign at Wakaf Center. MPN: 7669MDBST. Hurry! Limited time offer. Offer valid only while supplies last. 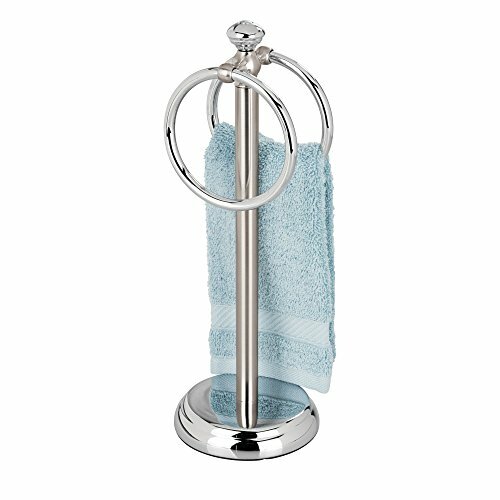 The mDesign Metal Ring Towel Holder combines function with classic style. It holds up to two fingertip towels while maximizing sink or vanity space. The mDesign Metal Ring Towel Holder combines function with classic style. It holds up to two fingertip towels while maximizing sink or vanity space. Made of durable steel, it features a free standing design for your vanity.